Not necessarily cute; more weird and mysterious like the person who wants to mature but cannot due to some grotesque condition. Most artists record scratch demos of their songs and later reimagine them as fully formed multi-instrumental compositions. 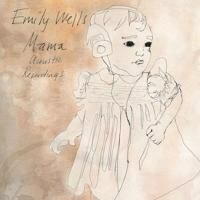 Not Emily Wells; she released her debut disc Mama back in 2012 with all sorts of electronic gimcrackery. Wells has recently rerecorded a new non-electric version of the album, appropriately titled Mama Acoustic Recordings. The results offer a more intimate look at Wells, whose breathy vocals and sparse accompaniment suggest a distinct amateurism of purpose. Look at me, she seems to be saying, I’m not just naked, I’m downright skeletal thanks to my do it yourself steampunk x-ray machine. Which can actually be very cool; Wells impresses though her simplicity. She sings and plays of hellos and goodbyes, the discovery of new places and the appreciation of old ones, and even dirty sneakers and underwear without claiming any transcendence in the commonality of things. Sometimes she seems to forget she's playing an instrument and just lets the music drop before picking it up again later with an oh yeah, that's right vibe. The one new track, "Los Angeles", fits in well with the other songs because they share a dreaminess that even a "burning up for you" confession cannot cut through. Her California city exists in the imagination where blurred edges take the place of corners. The point may not be clear, but that is the point—not everything has a deeper meaning. Wells is currently working on a film about the writer Richard Brautigan, and she shares the same elegiac imagination that bounces between willful self-deprecation and naïf grandiosity. On tunes such as "Johnny Cash's Mama's House" and "Passenger", her narrators simultaneously indicate that everything matters and nothing does. It all depends on one's state of mind, which is constantly shifting. Although Wells sings over minimal instrumentation, the words are still mumbled low, which implies she is not sure of the truth of what she's saying. Think of Zen koans and clap with one hand if you like it. That said, whether one prefers this new acoustic disc (actually, it is only being released as a digital download and vinyl) over the original is a matter of taste. Wells is an experimental artist whose live shows convey a sense of humor that seems missing from her recordings. However, her sweetness does come through in a Brautigan-like way. They both can come off as overgrown children. Not necessarily cute; more weird and mysterious like the person who wants to mature but cannot due to some grotesque condition. Imagine what it's like to never be in control but always waiting, waiting, waiting, for something to happen. As such, there is an underlying repetition to the music. Yes, the songs are all different but they are all the same as Wells does it again and again. It's not as if she's chanting. Her songs are not mantras as much as refrains. "I'm a passenger, I'm a passenger. Give me the keys, I want to drive," she sings. But she knows and we know that she's not to be trusted behind the wheel. She's just looking at life through the windshield and keeping the beat to the wipers.